Wobbling back and forth, we gain our sea legs just in time to SLAM! into the pier. And, this is nothing out of the norm while touring any one of the many passenger ferries on the Chao Phraya river. 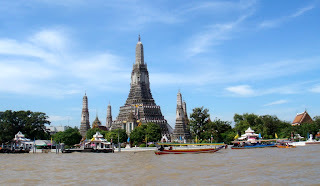 On this particular day, we have the honor of touring visiting family members through town and decide to take a quick hop on the boats before disembarking to visit Wat Pho. Tourists can buy an inexpensive and practical one day ferry pass and hop on and off the boats an unlimited amount of times in one day. But, today, with only one pier destination in mind, we opt to travel like a local and hop on a ferry ready to pay for one pier stop. Shaking her long brass box, the toll collector takes our change and provides us with our tickets. Once on board, the river comes alive. My two year old, from the backpack that my husband is wearing, shouts. His mouth opens and closes and we can't hear what he is saying over the roar of the sputtering motor of the engine. I'm wishing I had ear muffs to limit the assault on my eardrums as I cover my nose as to not gag on the diesel exhaust coming out of the engine in black clouds. My four year old sits atop the engine's large platform cover in the center of the boat, providing her with a sturdy (albeit outrageously loud) seat to handle the boats dips and turns. Our visitors hold on tight and take in the passing sights. 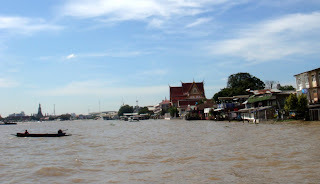 From this vantage point, one can imagine previous generations fishing along the once unpolluted Chao Phraya. Today, you'll see every type of boat imaginable: wooden fishing boats where men are pulling in a catch, traditional long tail boats kicking up long trails of water around them, a mucky wake of water as a passenger ferry goes flying by, families out for a troll and hotels shuttling tourists from site to site aboard their elaborately carved vessels. In the background, you'll see the majestic sites of ancient temples, spires of the royal palace, and a mixture of architectural styles from past and present. I see our pier approaching and brace myself amidst the crowded boat. The crazy docking procedure begins. Passengers move to the back of the boat, while the driver pilots us ever closer to the pier. Having done this several times before, I now know what to expect. As other tourists go flying and stumbling, I hold on tight while our boat SLAMS! into the pier. As fast as the jarring occurs, the boat is tied momentarily and people race to hop off the bobbing vessel. There is no ramp or bridge employed. Mind the gaping gap of sloshing brown water! I learned to make this from a woman while I was visiting Hua Hin, a beach town in the South of Thailand. The simple fresh ingredients make for a memorable soup, refreshing on both hot and cool days. Bring the water, lemongrass, galangal and shallots to a boil and cook for 3 minutes. Add the tomato and cook over a low boil for two minutes more. Add the mushrooms and the lime leaves. Add the prawns and spoon the liquid over the top continuously until the prawns turn opaque (about one minute). Turn off the heat and add the fish sauce and lime juice. Taste and add more of each to balance the flavor. You are looking for a nice balance between sour and salty. Add red pepper to taste. Place cilantro on top just before serving. Provide extra lime wedges. Finally, a new entry! I missed reading about your adventures. Hello! 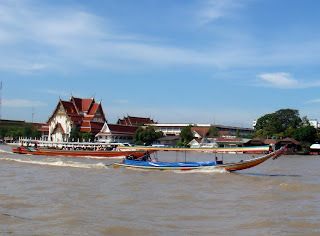 I just found your blog while searching for blogs of U.S. expats to Thailand. My husband and I are getting ready to make the jump and I thought that reading blogs like yours might help prepare us. As a bonus, you post recipes! We love to cook and can't wait to prepare some of your dishes. Kap kun ka! Sawadeekah Natalie, I'm so happy that you found my blog. Best of luck as you prepare for your new adventures. Since you enjoy cooking, please let me know if there are Thai dishes you'd like for me to research a bit and look for a local authentic recipe. Enjoy! Kahp kuhn kah!